The Biarritz Hotel is one of Jersey's longest established hotels and is ideal for couples and families alike. The Biarritz Hotel is one of Jersey's longest established hotels and is ideal for couples and families. The Biarritz enjoys an elevated position overlooking St. Brelade's Bay and has direct access to the promenade and the beach below. Founded over 60 years ago, the hotel has offered fellowship and quality hospitality ever since. All 42 rooms are en-suite and most enjoy a sea view. There is a choice of standard double or twin rooms, deluxe inland, superior and premium rooms which feature a balcony, and a few family rooms. All guest rooms are equipped with satellite television, telephone, hairdryer, telephone and tea & coffee making facilities. The hotel's restaurant serves a daily table d'hôte menu featuring a mix of modern & classic dishes 4 days a week and a buffet/carvery on the other evenings. Vegetarian options are available. The hotel also serves a Sunday lunch. The hotel is unlicensed but guests are welcome to bring in their own wine to dinner which they will serve to you free of charge. Cafe Biarritz is open lunchtimes and evenings for light meals, snacks, pastries and hot and cold beverages. The new sun terrace is an ideal place to relax and take in the magnificent view of the bay and surrounding area. There is a games room and a children’s play area. Some rooms are on the ground floor but the hotel doesn't feature fully equipped disabled rooms. Guest are welcome to join the devotions led each morning by a local minister. On Sunday mornings complimentary transport is arranged to the nearby Methodist church at St. Aubin. On Sunday evenings, following the grand buffet, there is a traditional 'Songs of Praise' in the main lounge. 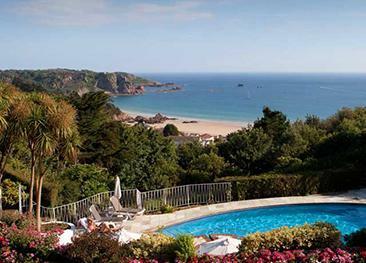 St Brelade’s Bay is one of the prettiest bays in Jersey, with golden sands and blue seas. The bay is bordered by restaurants and beach shops and offers all kinds of water sports from the beach. The swimming is safe and the panoramic sea views picture perfect, with small private boats moored bellow the pretty Fisherman’s Chapel at the western end of the bay. Small dogs are accepted in some bedrooms on a request basis and charged at £35 per night. Dogs are not permitted in the lounge or restaurant. 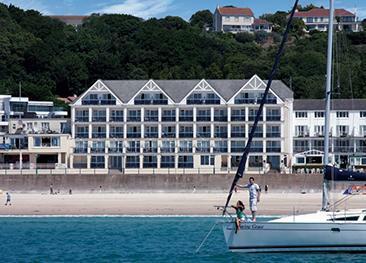 The Windmills Hotel is one of Jersey’s most spectacularly located hotels, overlooking the beach and the sea from above St Brelade’s Bay on the south coast of the island.